Everyday memories add immeasurably to our understanding of the world we lived in. Often people are bemused when I ask if I can interview them. They have no sense of how their stories can add to our understanding of a particular place and time. That their stories would be of any interest to anyone. This is a common assumption by working people, that their stories of life and work are of little or no importance. The consequence of this assumption for our archives, is that too few of us keep any records; any photos, press cuttings, memorabilia; of our lives, our work and our struggles. But we have our memories. One of the ways that can work in kick starting oral histories is to bring together interviewees in a group, this can often be very productive. The participants gain confidence as the recordings progress and as each person jogs the memory of the others, more and more stories are recounted. For this to be productive though we need to ensure that plenty of time, and tea breaks, are built into each recording to help stories flow. The work we do and the reason why projects like this are so important, is that in 100 years time people will still get to hear the voices of people talk about their lives today. 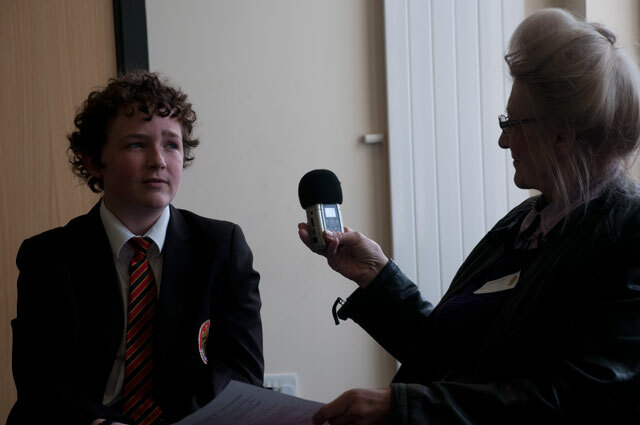 One of our volunteers interviews a student at Thomas Hardye School.